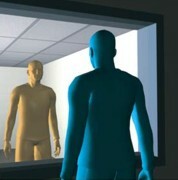 A two-way Mirror looks like any other mirror when viewed by those who are unaware of its presence. The basic principle behind a two-way mirror is it acts as a window from one viewpoint, however, when viewed from the opposite side it acts and looks like a normal mirror. They do, however, have a broad range of other uses. Within scientific environments, mirrors of this type can be used to assist with the observation of experiments and subjects. This allows the behaviour to be observed and recorded without the intrusion that might otherwise be necessary. Such mirrors are also suitable for use in hospitals, including within operating theatres for student viewing areas. We are able to make these mirrors to any size, ensuring that you can buy a two-way mirror to suit your specific needs or circumstances. We currently supply two-way mirrors in 2 categories, 2 Acrylic: 3mm acrylic and 6mm acrylic. 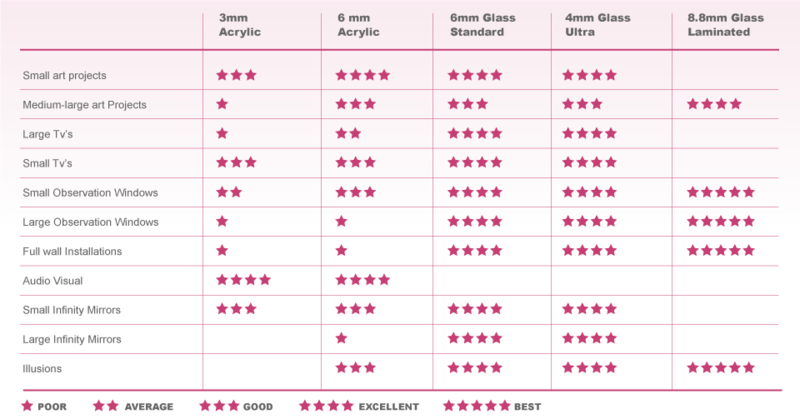 Plus 3 types of glass with a two-way finish 6mm Standard two-way, 6mm Light two-way and 6.4m Standard Laminated two-way. All of our mirrors are manufactured to the very highest quality and can be specifically tailored to meet your individual requirements. Our standard sizes (Acrylic ONLY) are normally delivered from stock with a couple of days, whilst our fully tailored and made to measure solutions are normally delivered 10 -14 days from order. All our mirrors can, of course, be framed in any of our fantastic range of moulding designs, ensuring that they work well with a variety of backgrounds and wall surfaces. Use our online tool for your FREE quotation, and we’re also happy to supply samples, allowing you to see the quality of the products that we provide. Whatever use you have in mind, you'll discover that buying a two-way Mirror from Mirrorworld will ensure that you get the product you require and the quality that you deserve. 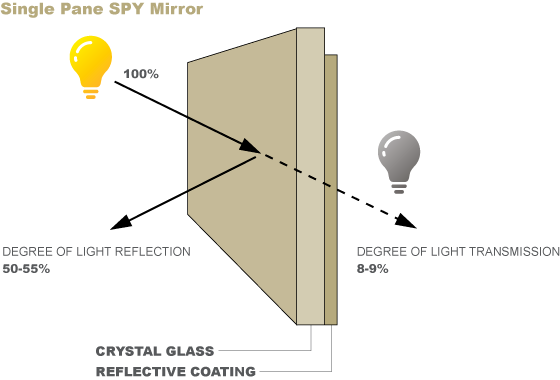 Technically, Two-way mirror is a semi-transparent film of aluminium deposited on an acrylic or glass substrate. 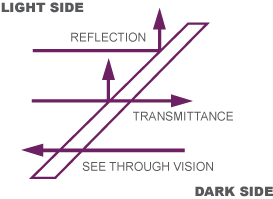 Allowing a percentage of incident light (Transmittance) to pass through while reflecting (Reflection) the remainder. two-way mirrors can be seen in many varying environments including Airports, Banks, Supermarkets, Care centres and Police Stations are the obvious ones but Universities, Art galleries, Theatres and the Home are some that may not spring to mind straight away. Surveillance for a Shops, Showrooms, or Bank. Hidden television, TV in the bathroom. New housing projects, home improvements. Animal cages: fish tanks, bird feeders, etc. With careful consideration when installing a two-way mirror, a dramatic difference can be made to its overall effectiveness. We recommend that you think beforehand how it’s going to blend with the surrounding environment with special care taken about the positioning to get the best use of the available ambient lighting conditions. IMPORTANT: In order to maximise the functionality of the product, it’s important that there is a significant light difference between the two sides. FOR OBSERVATION. IT HAS TO BLEND. 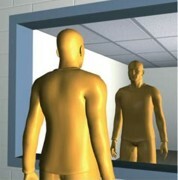 Try to put an everyday object partially in front of the mirror. e.g. plant or vase. This will take the casual eye away from the mirror as a whole. IN ALL CIRCUMSTANCES IT HAS TO BE PROPERLY LIT. The viewing area must be darker than the area to be observed for the special mirror surface to work properly. The large the light difference the better the result. IT HAS TO BE SECURELY HUNG ON A WELL PREPARED WALL. For framed mirrors, this avoids detection by simply lifting the mirror up to reveal the observation area. Or allowing light to leak behind and spoil the effect. IT HAS TO BE PROPERLY MAINTAINED. Scratches in the surface can lead to light penetration through the two-way surface and ruin the overall effect. With TV installation for instance, always make sure the coated surface is on the inside and away from any possible accidents. 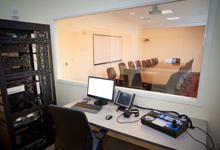 A two-way mirror is often called a "one-way mirror" by members of the general public. The misconception is that such a mirror acts as a mirror from one side, and acts as a window (letting light through) from the other side. Actually, the two-way mirror is letting about half of the light through, and reflecting the other half of the light, from both sides. 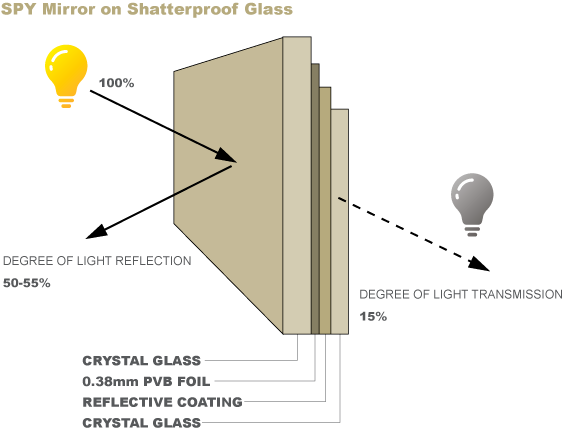 it is also called a half-silvered surface, as just enough reflecting metal film is deposited on the glass so that about half of the light is reflected. 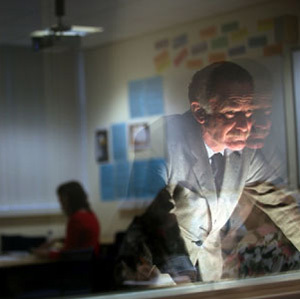 So, why does a two-way mirror seem to behave like the two sides are different? It behaves this way when one side is in the dark. Then almost no light goes from the dark side to the light side, and almost no light is reflected back from the dark side to the dark side. Most of the light comes from the bright side. Plenty of light travels through the mirror, and plenty of light is reflected back. To people on both sides of the mirror, the light from the bright side overwhelms the light from the dark side. So, people on the bright side see a mirror, and people on the dark side see a window. See the diagram. Tip:- Infrared remotes work through two-way Mirrors. Our mirrors are manufactured to the highest quality, providing optimum translucency and clarity. Specifically tailored for home, office or workplace these two-way framed mirrors and mirror panels are perfect for all your security and science applications. Whatever your needs our mirrors provide a professional finish. Our Mirror panels and framed mirrors are available in a number of standard sizes for convenience, as well as custom-made size for the more exacting specifications. All mirrors come with complete installation fastenings where applicable. Samples available to purchase from our shop 175 x 125mm.